Words with Friends burst onto the scene and was the hottest mobile game around, essentially letting us enjoy Scrabble with friends on the go. With that in mind, Zynga released a new title called Words on Tour, but will it muster the same fervor and fire in people that its predecessor did? Words on Tour is similar to Boggle. You receive random groupings of letters and must find words by connecting adjacent ones. 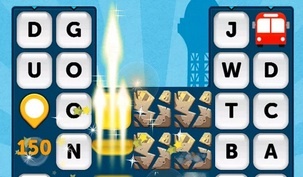 Words on Tour has different objectives for different puzzles. Sometimes you clear a certain amount of tiles or letters to reveal a phrase like Wheel of Fortune. These different objectives help change the gameplay, keeping things fresh. Simply put, it's too easy. Not once did we feel in danger of losing. On top of that, the game works on a stamina system where running out of lives means having to wait until they replenish. The game also doesn't have a multiplayer option, which was the backbone of Words with Friends. Words on Tour is a decent game, but doesn't have the same player connectivity or uniqueness of Words with Friends. Considering Zynga published both titles, it's quite odd the company failed to innovate on one of its biggest efforts. Tour is worth a play, but don't expect to enjoy it long. Download Words on Tour for iOS and Android.